This scarce antiquarian book is a selection from Kessinger Publishing's Legacy Reprint Series. Due to its age, it may contain imperfections such as marks, notations, marginalia and flawed pages. Because we believe this work is culturally important, we have made it available as part of our commitment to protecting, preserving, and promoting the world's literature. 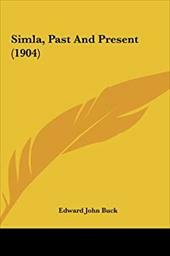 Kessinger Publishing is the place to find hundreds of thousands of rare and hard-to-find books with something of interest for everyone Simla, Past and Present (1904) Buck, Edward John This scarce antiquarian book is a selection from Kessinger Publishing's Legacy Reprint Series. Due to its age, it may contain imperfections such as marks, notations, marginalia and flawed pages. Because we believe this work is culturally important, we have made it available as part of our commitment to protecting, preserving, and promoting the world's literature. Kessinger Publishing is the place to find hundreds of thousands of rare and hard-to-find books with something of interest for everyone! Internationaler Buchtitel. In englischer Sprache. Verlag: KESSINGER PUB CO, 390 Seiten, L=178mm, B=254mm, H=22mm, Gew.=889gr, [GR: 11110 - HC/Belletristik/Romane/Erzählungen], [SW: - Literature - Classics / Criticism], Gebunden This scarce antiquarian book is a selection from Kessinger Publishing's Legacy Reprint Series. Due to its age, it may contain imperfections such as marks, notations, marginalia and flawed pages. Because we believe this work is culturally important, we have made it available as part of our commitment to protecting, preserving, and promoting the world's literature. Kessinger Publishing is the place to find hundreds of thousands of rare and hard-to-find books with something of interest for everyone!